Ritchie Blackmore says there may be more Rainbow shows in the band’s future if three scheduled concerts next year go off as planned. The group will perform the Best of Rainbow and Deep Purple at the Monsters Of Rock festivals in Loreley, Germany on June 17 and Bietigheim-Bissingen, Germany on June 18, as well as a solo headlining date at the Genting Arena in Birmingham, UK on June 25. The 2016 shows marks a rare return to rock by the guitarist after years as the leader of Blackmore’s Night, a medieval folk band he formed in 1997 with then-girlfriend and now-wife Candice Night. 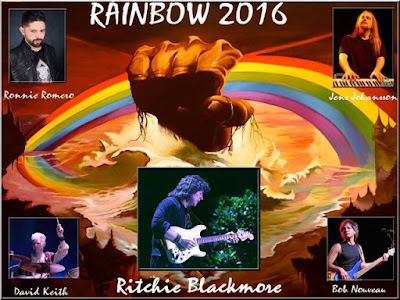 "Blackmore’s Night will go on,” Blackmore tells Rich Davenport’s Rock Show, “and this is just a brief intermission of playing some good old rock, but with some good friends and some good musicians. And hopefully everybody's there for the same reason, which is it's good music and it's nostalgia, and hopefully everything goes well. “And if it works, we'll do, obviously, more dates. We're only doing three this first time. But, like I said, if it works, we'll do more later on." The guitarist will be joined by Lords Of Black singer Ronnie Romero, Stratovarius keyboardist Jens Johansson, Blackmore’s Night drummer David Keith, and bassist Bob Nouveau.